Step Up brings you professional trainers specialized in aerobic step workouts, to help you burn all the calories you ever dreamed of. Developed in collaboration with Laval University experts, Step Up's selection of workout moves are designed to be intuitive and easy to remember. Step Up comes with many difficulty levels and a variety of songs with various BPM (beat per minutes) allowing you to configure your training session exactly the way you want it. Versatile configurations allow beginners to have a great exercise session while Step Up can push even a gym professional to their limit. 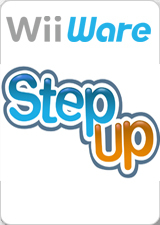 Step Up can be configured to work with the Wii Balance Board or with a basic aerobic step in similar size. Developed by University and gym experts. Ultra configurable and suitable for everyone. The graph below charts the compatibility with Step Up since Dolphin's 2.0 release, listing revisions only where a compatibility change occurred. This page was last edited on 23 January 2018, at 05:26.